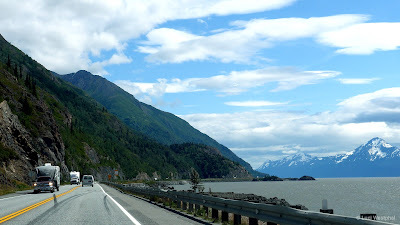 Alaska Route 1 (AK-1) is a state highway that runs from Homer at the southern tip of the Kenai Peninsula, through Anchorage and all the way up to Tok (near the Canadian border). Alaska Route 1 must be one of the most scenic and stunning... Look at those mountains rising up right in front of you! Check out the color of that river water! There's a whole moose family! Wow, Kachemak Bay! In this 1-minute video, I'm showing you glimpses of the changing landscape on the drive south from Anchorage to Homer, covering the entire Kenai Peninsula. The drive took place in late June. A little road trip trivia: I was in Alaska this summer to film Tessa Drais in Homer for my documentary All's Well and Fair. She has been part of the project, which I film every 10 years, since she was 7 years old and living in Florida - she is now 27. Scott was along on the trip for some Alaska fly-fishing. I've already published 1-minute videos of Homer and Kenai Peninsula - and plan on publishing an extended video of Homer next week. The song in this video is "Heading West" by Jason Shaw of Audionautix. He has made this and many wonderful songs available via a Creative Commons license. Thank you again and again, Jason! I’ll be posting photos from the Alaska Route 1 drive throughout this week to the In Another Minute Flickr album, on Google+ and Facebook… and there will be a dedicated photo post on this blog.